So I felt like a filling, satisfying but healthy tea tonight without the need to spend too much time cooking and so decided to try making a version of the chicken kebabs we so enjoyed in Istanbul a few weeks ago! I’m not sure how authentic the marinade is, but I made it by throwing a few ingredients together that I thought would work and was quite pleased with the result. I put a slug each of olive oil and lemon juice in a bowl, then added some paprika, cumin and chilli powder. 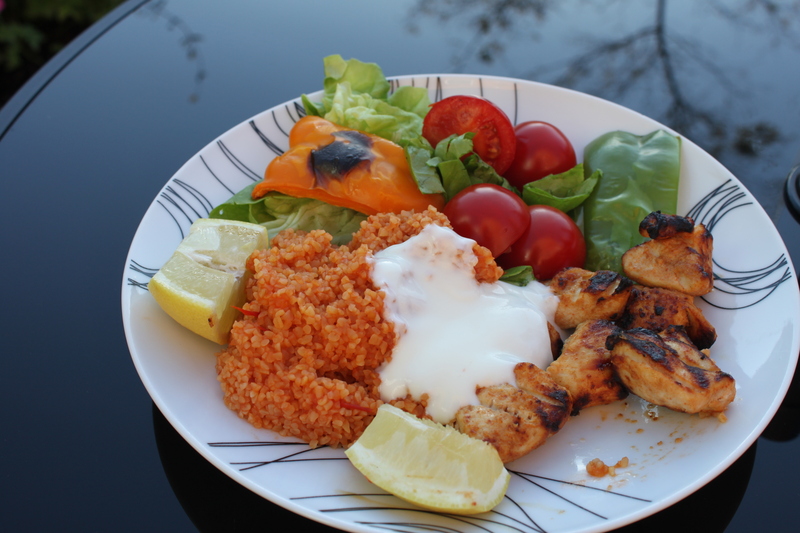 This tasted pretty good but seemed quite thin and I wasn’t sure how well it would coat the chicken so decided to add a few spoonfuls of the yoghurt I had to serve with the finished meal. This added a lovely tanginess as well as thickening things up a bit helping to coat the chicken and keep it lovely and moist. Add the diced chicken and leave for at least half an hour, preferably longer. 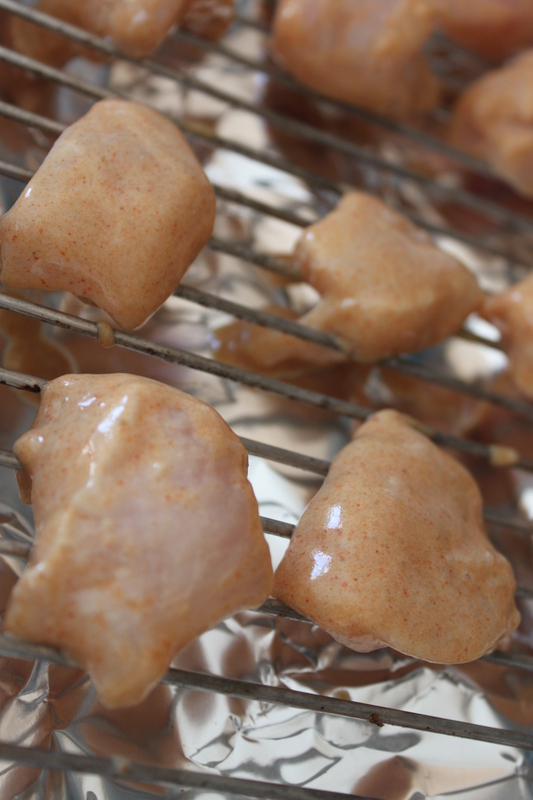 I was going to put the chicken on skewers to cook but didn’t have any so just whacked them under the grill on a tray. Meanwhile, chop up some tomatoes, ideally you want them to be juicy and almost bursting out their skins with ripeness. 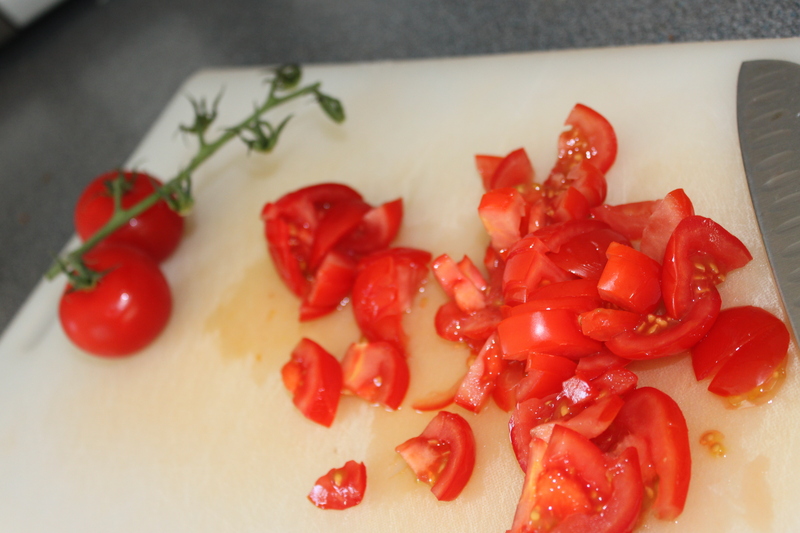 Add the tomatoes with two cloves of crushed garlic to some hot oil and season with a decent pinch of salt. Let this bubble away until the tomatoes have broken down. When ready, stir in the bulgur wheat then add boiling water. 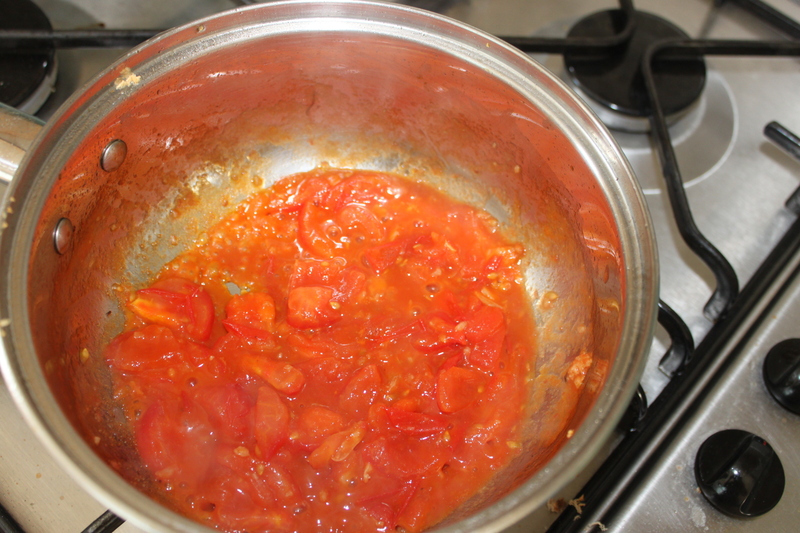 I also added a little extra salt and some tomato puree at this stage for extra flavour. Leave to bubble away until ready. When the chicken has around 10 minutes left to go, add the sliced peppers and reaming tomatoes to the tray under the grill until just blackened. Prepare the salad and when everything is ready serve up with some lemon wedges and a good dollop of yoghurt. Yum! If you’re lucky enough to enjoy a brief and opportune moment of sun on a grey overcast day as we were, eat in the garden! The only thing that was missing that would have been nice to have was the Turkish bread, perhaps I’ll have to investigate that for next time! So last night I met one of my good friends for tea and we went to one of my favourite local restaurants, which just happens to be around the corner from my house, hurrah! The restaurant, Yakisoba in Chorlton, is a Japanese restaurant with some other oriental dishes on the menu too. Yakisoba is a great place for a mid-week meal as its relaxed informal atmsphere makes you feel like you’re just sat around in your extended dining room with friends (or maybe that’s just because I visit so often!) Everyone I have taken to Yakisoba has enjoyed it, infact, the last time my parents visited, they asked if they could eat there on both the Friday and Saturday night! Quite an endorsement! The food is really tasty and, one of my favourite things about Japanese, really clean, fresh and light tasting. You get good sized portions and the prices are really reasonable. So, all in all, pretty good! 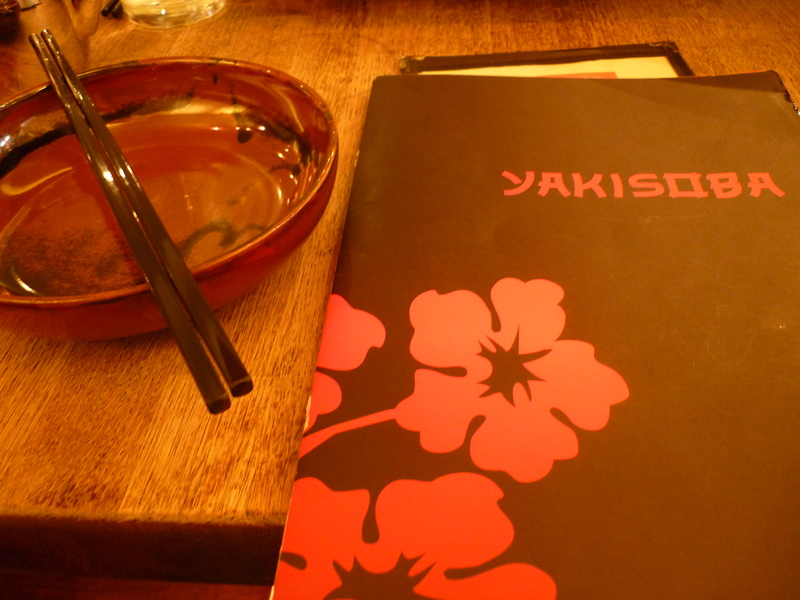 I’ve been to Yakisoba many times in the year since I’ve lived in Chorlton, but decided as I have this new blog that I would write about it after visiting last night. As my friend and I got comfy we ordered some green tea, seeing as it was a school night early on in the week! They also serve a very refreshing Japanese beer, Kirin which makes for a nice drink if you’re feeling the need for something alcoholic! 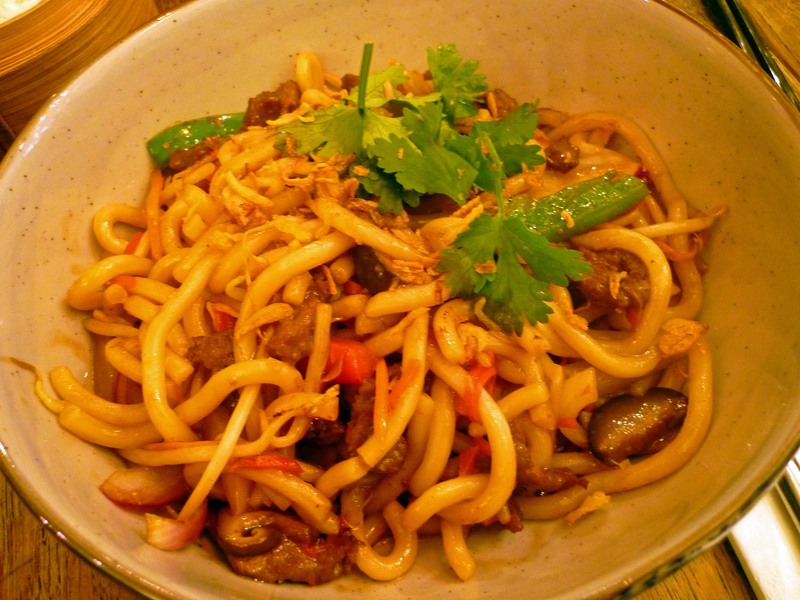 Yakisoba has a brilliantly varied menu and I have tried many things off it, although do have a handful of firm favourites from which it is difficult to deviate from as they are so tasty and satisfying! Some of my loved and trusted favourites include the ginger and wasabi chicken – which has the slightly odd inclusion of sun dried tomatoes, but aside from that a lovely fresh, healthy feeling dish with perfectly balanced flavours – the wasabi doesn’t overpower! Also the ‘crispy puffy sea bass’ which comes with a really delicious spicy fruity punzu sauace – a proper punch in the mouth of flavour. Another Yakisoba Big Hitter for me is the slow cooked Chinese style beef. So, not Japanese, but oh so tasty! This dish comes to the table with its own little flame underneath to keep the delicious Chinese spice flavoured sauce bubbling away. The beef is absolutely melt-in-the-mouth and comes with loads of delicious seasonal greens. I loved this dish from the moment the steam rising off the flame-hovering dish wafted over my face the first time I ordered it! Divine. Back to last night. When I eat in a group of bigger people, I love to order the steamed dumplings mixed platter to share around. Sticky little globes of different shapes promising a delicious mouthful as soon as you bite into them. The platter includes a good selection of meat, prawn and veggie fillings and comes with dips and Japanese pickles. As it was just the two of us, we felt this would be a little excessive and so settled with ordering some pork siu mai dumplings to share. 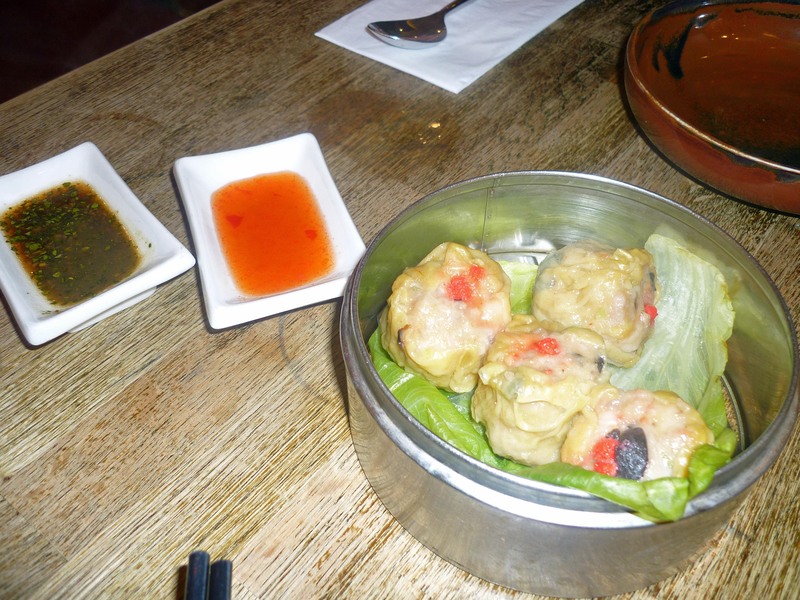 These pork and prawn filled dumplings managed to be both meaty and light at the same time and came with sweet chilli dipping sauce and, my favourite, a sort of coriander soy which I think also has a little crushed garlic and shallot in it. I need to try and create at home as it is so moreish! One of the best things about Yakisoba is that along with your main, you get a bento box. 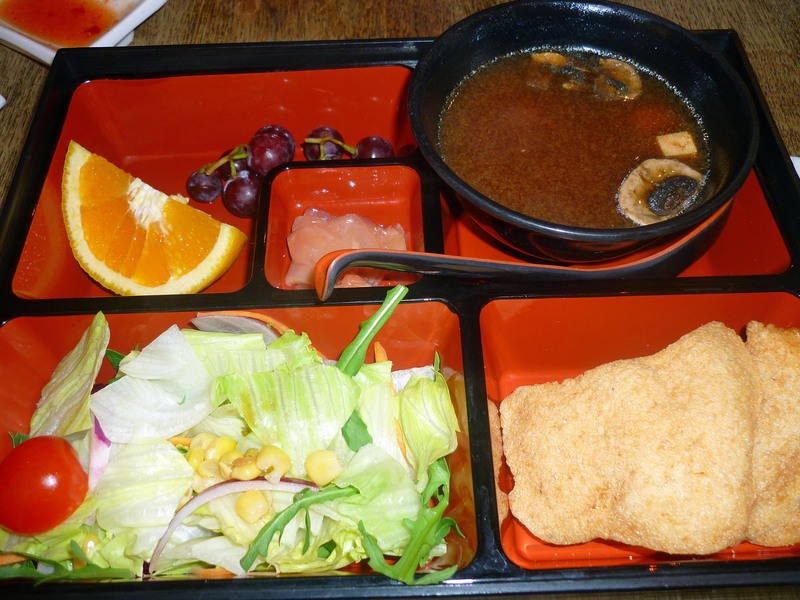 A bento box is a Japanese lunch box with lots of little compartments to put your different foods in. A traditional Japanese bento box would probably consist of fish or meat, some rice, and some pickled vegetables. The prawn crackers (really-prawny!) are great to nibble on with the leftover sweet chilli sauce while awaiting your main course. The little salad, which has more of that corriander-soy type dip on it as a dressing, is great to refresh your palate between courses. I’m yet to figure out what the yummy broth is, despite asking everyone I’ve eaten here with. Lots of people have suggested miso, but I’m not sure that it is… Whatever it is, it has a lovely gentle peppery heat which builds at the back of your mouth as you eat it and has mushrooms and tofu in it. I must say I was a little disappointed that the little middle compartment of the box, which normally includes some fantastic sesame covered honeyed cashews had been filled with a little smoked salmon instead. Hhmm. The fruit was also missing the usual juicy melon slice, but is a nice refreshing way to end your meal. Moving on the mains, my friend ordered one of my other all time Yakisoba favourites, the teriyaki fillet steak. Despite having eaten it numerous times, and having ordered the tasty yaki udon noodles for myself, I definitely had food-envy when it arrived. 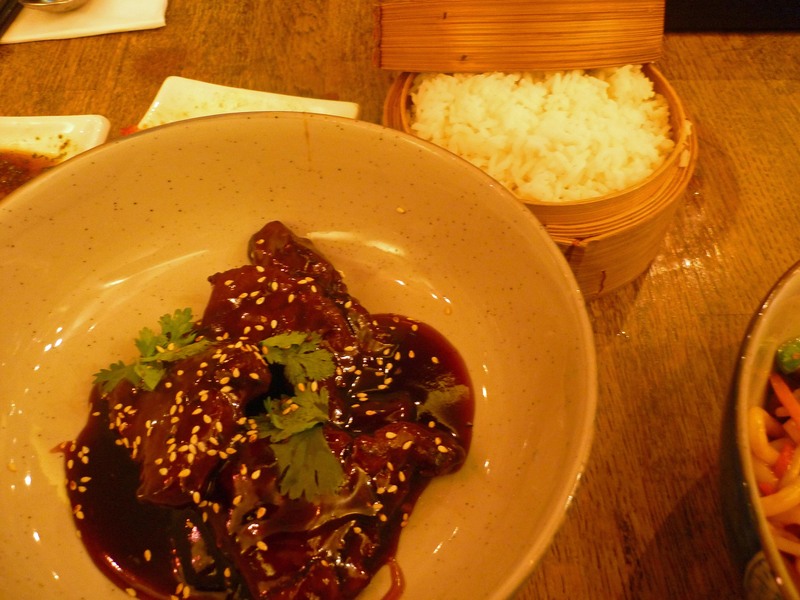 The delicious succulent meat is covered in an irresistibly-sticky teriyaki sauce and sprinkled liberally with sesame seeds and coriander for a bit of lift. It’s served with perfectly cooked fluffy steamed white rice. Seriously good. I ordered the yaki udon. I adore udon noodles and these were just as good udon noodles should be, thick and lipsmacking, glistening with sauce. The dish consisted of shredded fillet steak and loads of veggies including onions, peppers, shitake mushrooms and bamboo shoots in a lovely gingery sauce. A very tasty and filling meal as I have come to expect at Yakisoba! Perhaps next time I’ll branch out and try another new dish. Just as long as no one else orders one of my top dishes and I’m struck with more terrible food-envy forcing me to solicit ‘just one more little taste’ from my dining partner! Well, after years of taking crazy amounts of pictures of food on holidays, food in restaurants and food that I’m cooking as well as generally liking to talk about food and recipes an awful lot, I finally listened to my friends and other half and decided to start a food blog. Maybe they think if I have an outlet I’ll stop bombarding them with so many food pictures and stories! 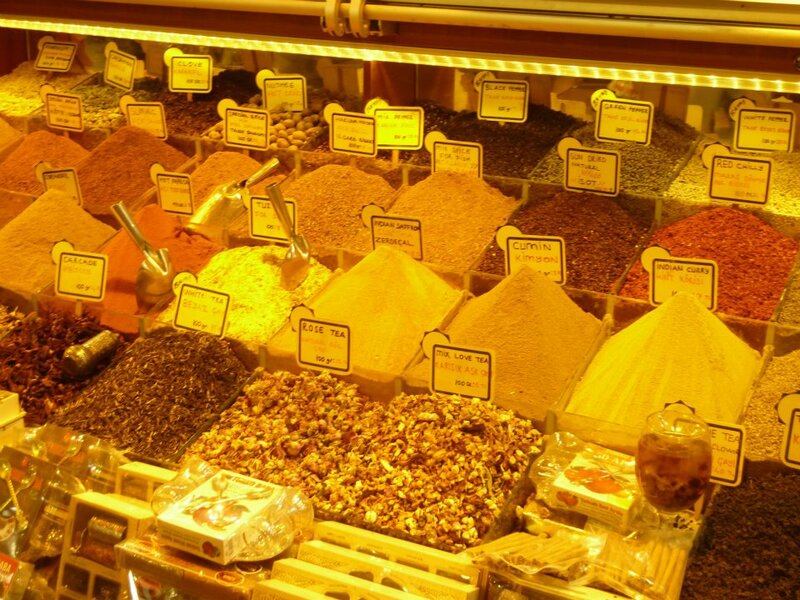 So, what better place to start than the trip to Istanbul I just got back from last week? 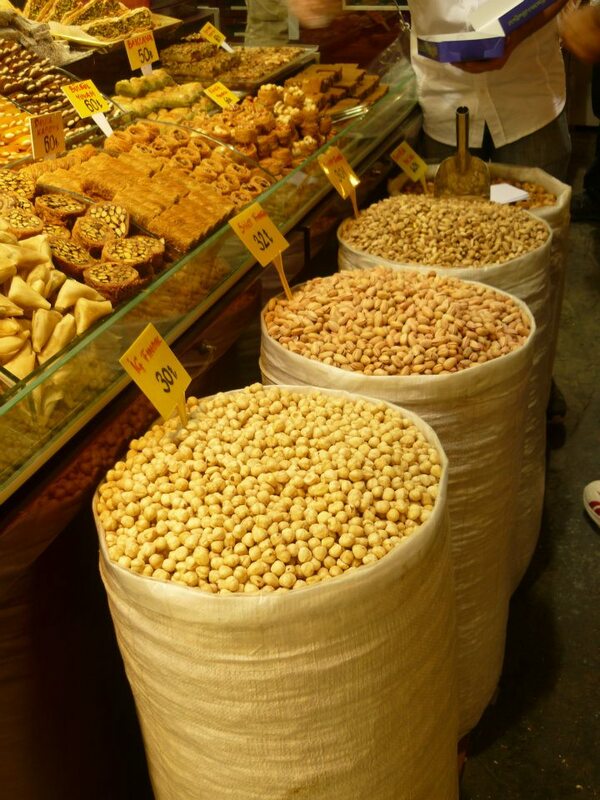 I was pretty excited about Istanbul, I’d wanted to go for a long time and was very excited about the history, the architecture, the culture and, of course, the food! 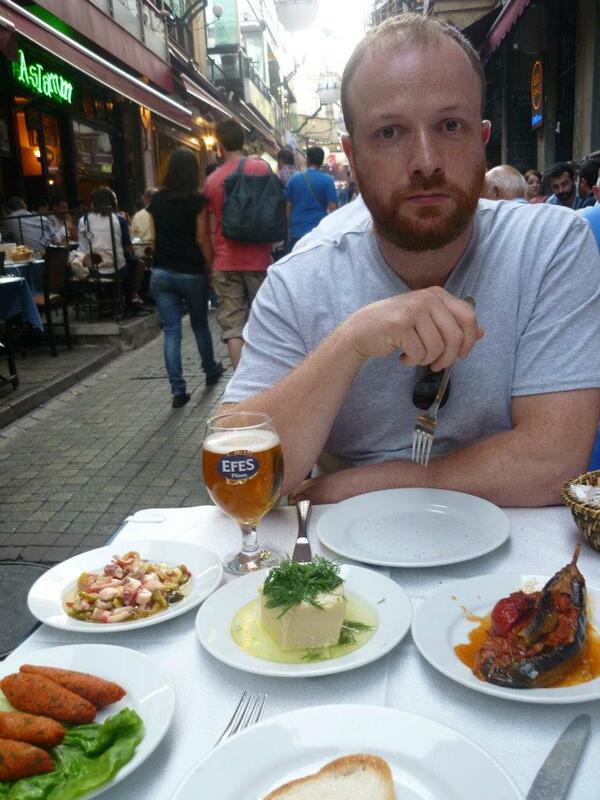 I sat in my dreary office in the days before leaving day-dreaming of endless mezze, fresh fish, kebabs and baklava. The week of eating started well with a 3 course meal on the flight! Having rarely flown on a Proper Airline this was quite a novelty. This included potato salad with yoghurt, aubergine stuffed with chicken and bulgur wheat in a tomato sauce as well as some sort of cheesecake. 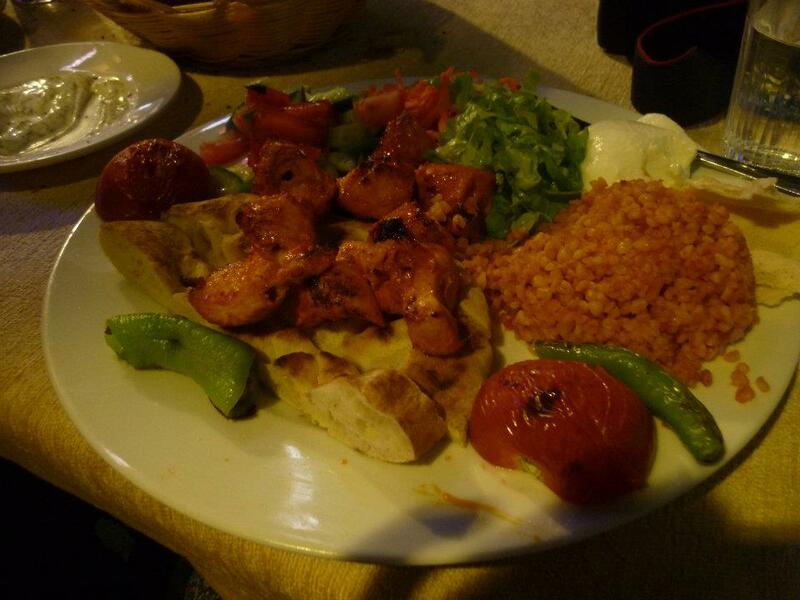 After arriving in the city as dusk fell, we headed straight out in search of our first real Turkish kebab. We stumbled across a small kebab joint just round the corner with locals eating outside and took this to be a good sign. I can’t remember what my kebab was called, buy boy was it good. 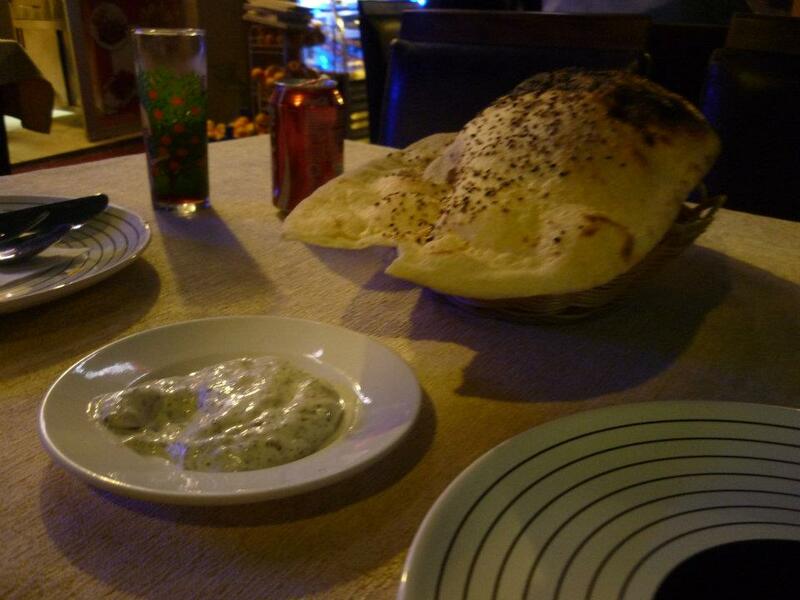 Firstly we were brought some cacik, a yoghurt and cucumber dip, sort of like a thinner tzatziki, with a delicious sesame covered naan-style bread. This was quickly devoured and we were onto the main event. The kebab. 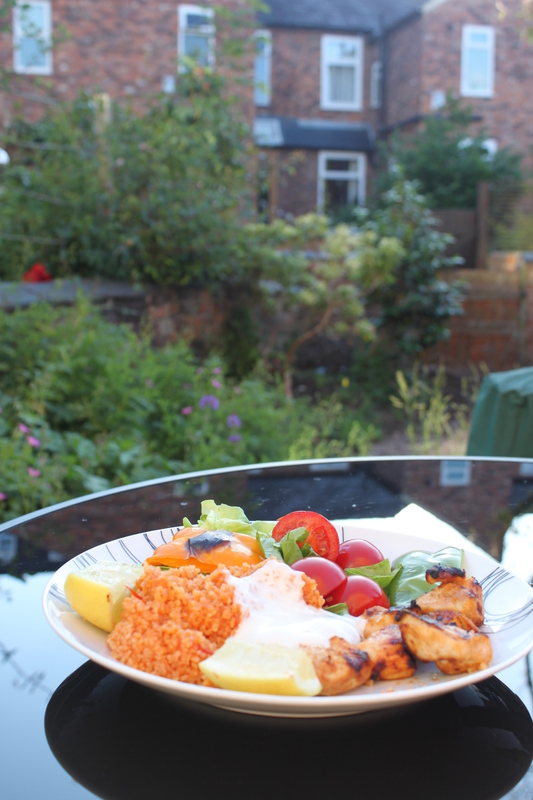 Delicious chunks of juicy grilled chicken, perfectly chargrilled tomatoes, more naan-like bread, lovely thick natural yoghurt, bulgar wheat cooked with tomato and a big pile of lettuce, cucumber, tomato and peppers – who say’s kebabs aren’t healthy?! We were to return to this particular neighbourhood kebab spot several times throughout the week! Other kebabs we enjoyed included cubes of lamb on a puréed aubergine and yoghurt base as well as chunks of lamb and aubergine grilled together all served with delicious tomatoey bulgur wheat. The best place I ate this aubergine and lamb kebab was infact in a small local lokanta, like a canteen, where you stood at the counter and pointed out which food you wanted. 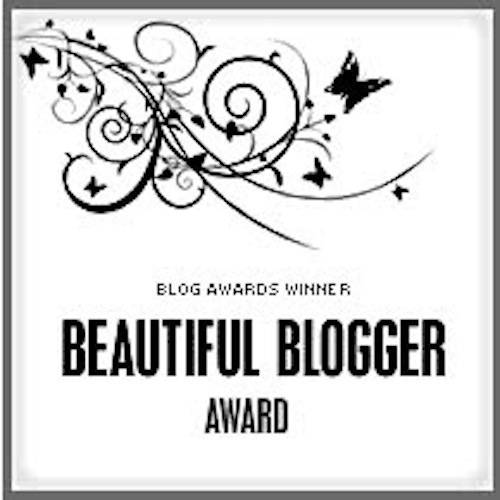 I had mine with an amazingly simple but flavoursome spinach, yoghurt and garlic dish. In fact, as you might expect, aubergine featured heavily in our Istanbul diet, from fried aubergine with yoghurt (divine) to roasted aubergine stuffed with rice, meat and herbs or onion and tomato. One particularly delicious stuffed aubergine (or patlican dolmasi) was enjoyed in a pavement cafe serving up massive trays of mezze. It was served cold and the rich tomatoey, garlicy filling perfectly complemented the taste of the aubergine. We just don’t seem capable of getting flavours like that out of vegetables in this country?! I guess we don’t enjoy the same fresh produce a lot of the time. Other mezze dishes that evening included; slivers of spicy tomatoey, vaguely grainy, deliciousness which we smothered on bread – I’m yet to find out what they were called, a delicious octopus salad with pickled vegtables, crispy rings of calamari, and cheese boregi – a pastry stuffed with feta cheese. 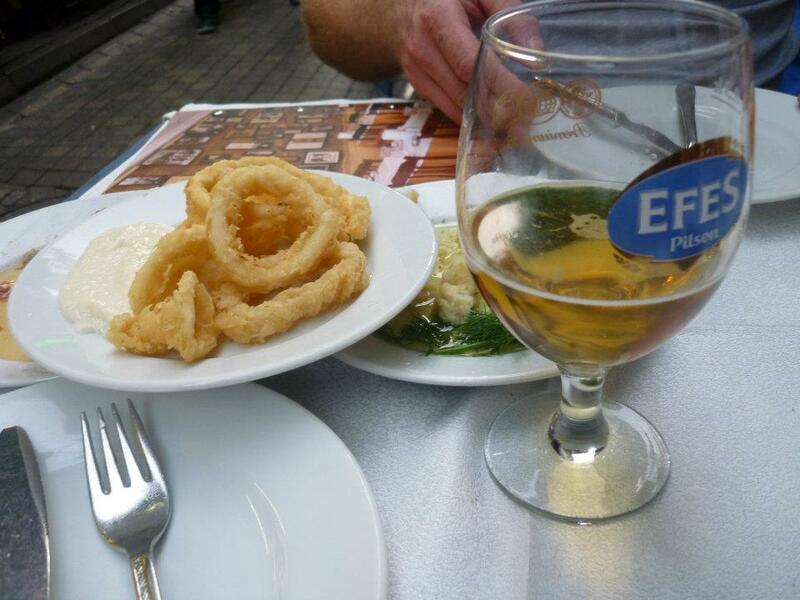 All washed down with the local pilsner, Efes! 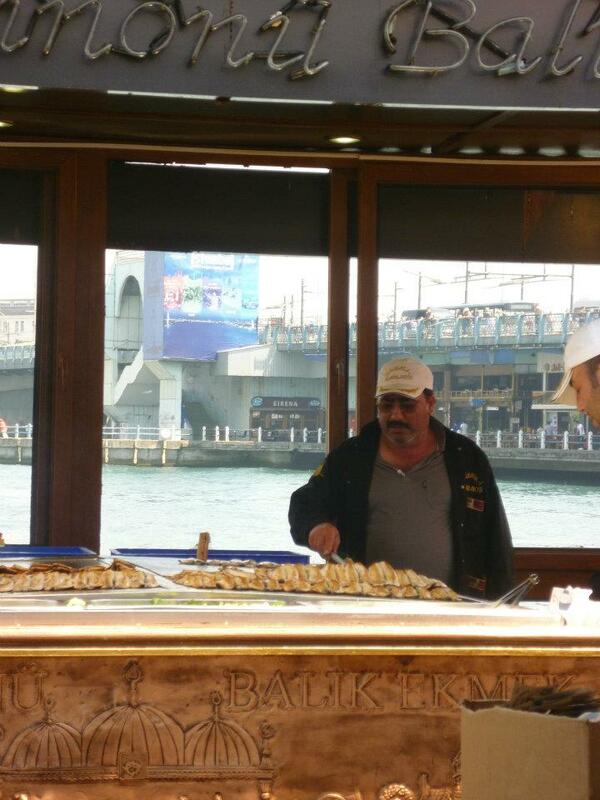 Another delicious foodstuff in Istanbul is of course fish – so fresh! While we saw lots of street stalls selling mussels and oysters, I wasn’t quite brave enough to count on their fresh status, I did however head down to the docks on the Eminonu where I enjoyed a fresh fish sandwich straight off the fisherman’s boat! 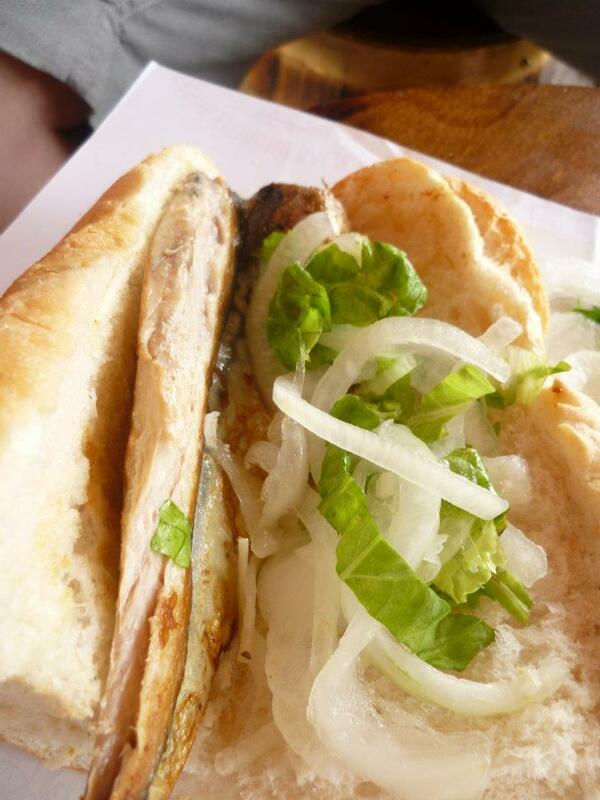 Freshly caught grilled mackerel shoved straight into half a loaf of bread with salad and slathered with lemon juice and salt, perfection! What better or fresher lunch could you ask for?! And for the equivalent of around £2! Before heading out for our day of eating, ahem sightseeing, the lovely local lady in our hotel made sure we were set up for the day with a big Turkish breakfast enjoyed on our delightful roof terrace overlooking the Bosphorus on one side and Blue Mosque on the other! Perhaps the best spot I’ve ever been lucky enough to enjoy breakfast! 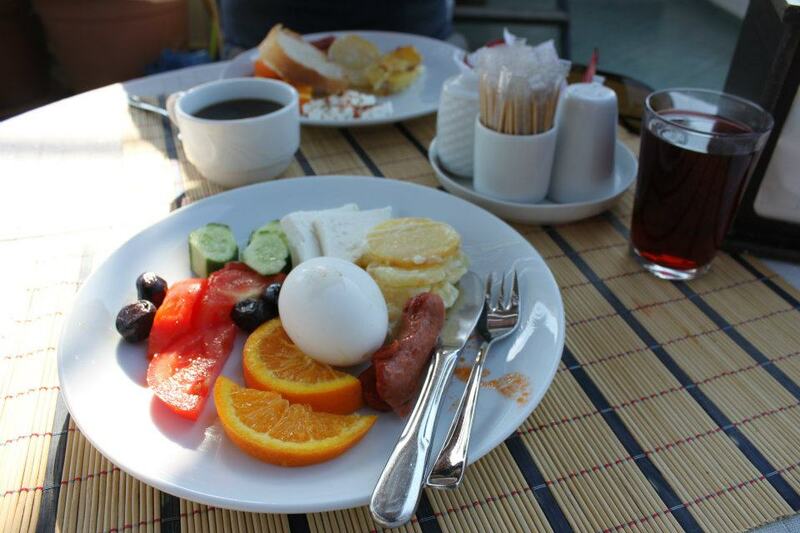 This typically consisted of big piles of fresh fruit – oranges, apricots, watermelon; tomatoes, cucumber, olives and feta cheese; hard boiled eggs, Turkish sausage, a delcious baked potato and creamy cheese dish, yoghurt with jam and a tantalising selection of homemade cakes. I must admit I got rather partial to eating a mountain of feta crumbled over watermelon every morning! 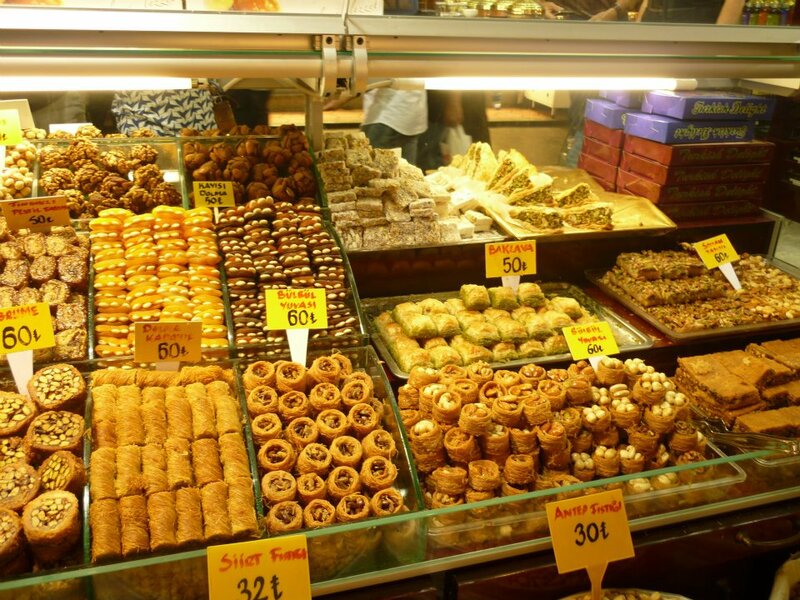 Now, following all the mouth-wateringly tasty savoury foods, of course, were the sweets, oh the sweets! The Turks really know what they’re doing here! 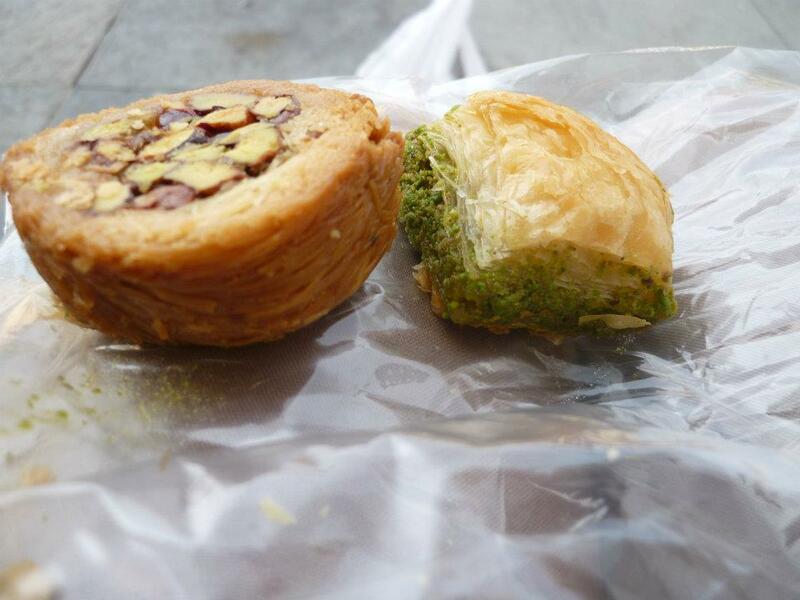 Countless crumbly pastries with honey, pistachios, walnuts, hazelnuts… Before going to Istanbul, I had no idea there was any other kind of baklava than that stuffed with pisachio, but there are all sorts. Walnut was one of my other favourites, although I must admit I do love pistachio! 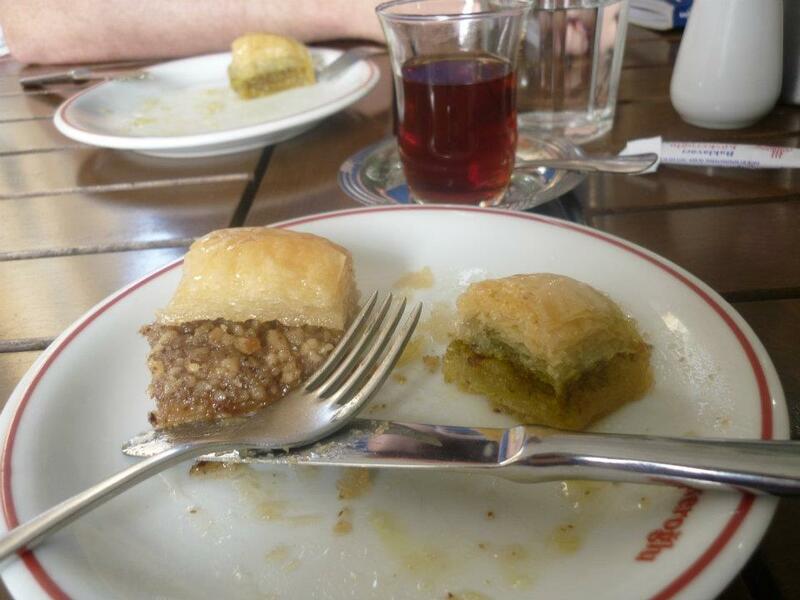 Baklava and the other similar desserts were a great afternoon pick-me up! Talk about a sugar hit! 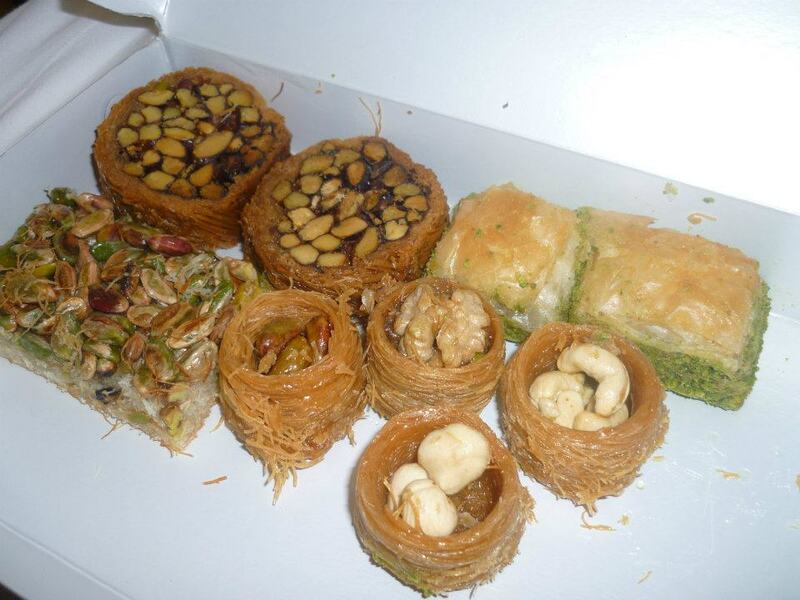 I’m not sure what these were called, but little bite-sized shredded filo pastry nests filled with a variety of nuts were also a big hit! 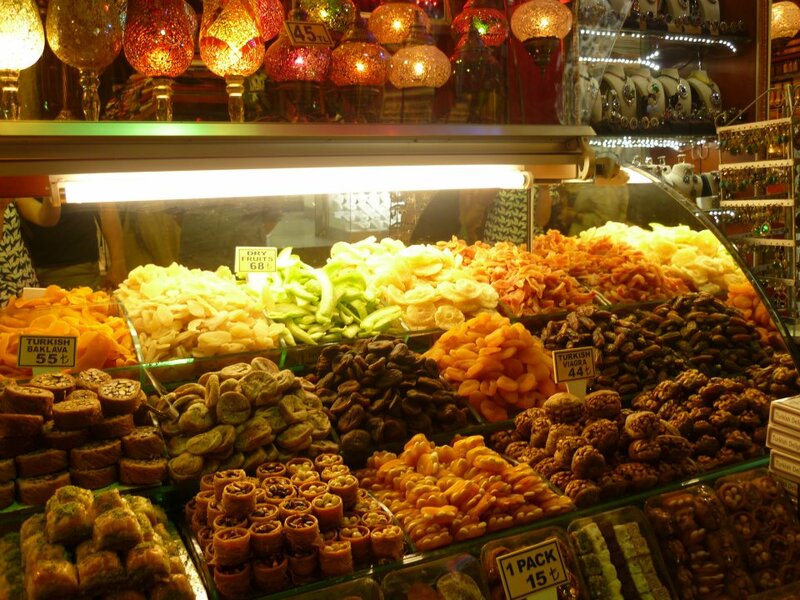 The spize bazaar was a great place to fill up on these moreish treats, as well as other delights such as apricots and dates stuffed with cashews or almonds. Some of the delicacies had interesting promises to make! The market was also full of delicious shiny globes of Turkish Delight. 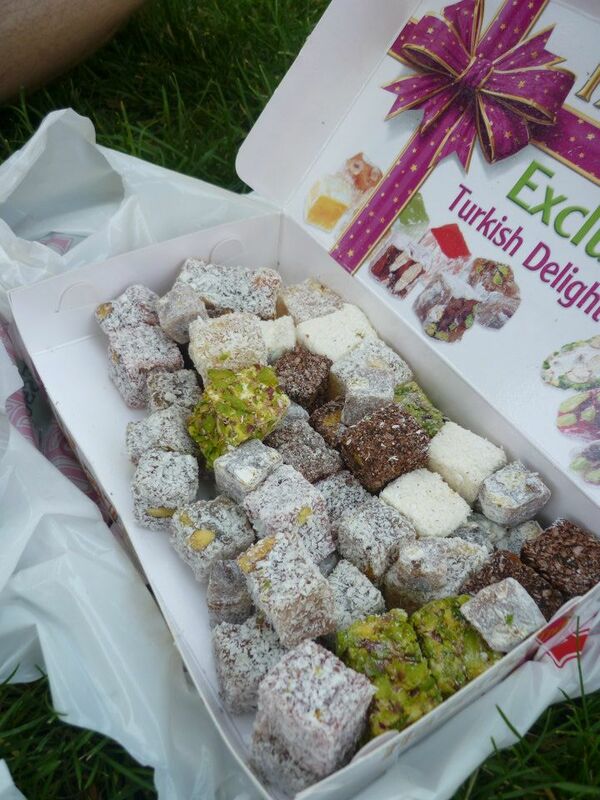 Little did I know that the soft squidgy Turkish delight dusted with copious amounts of icing sugar that you get are in fact made specifically for the tourists! 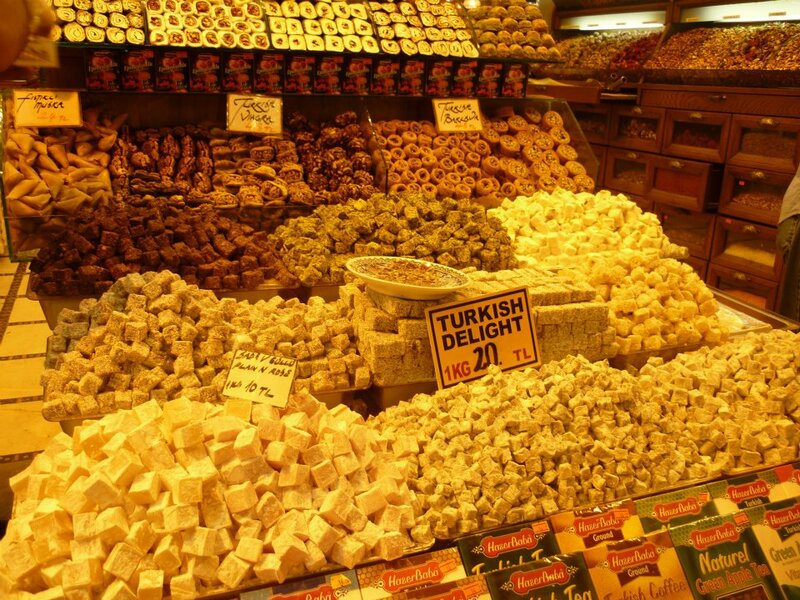 Real Turkish delight is much firmer, often dusted in dessicated coconut as opposed to icing sugar, and packed full of, you guessed it, more nuts! I actually really liked both kinds! 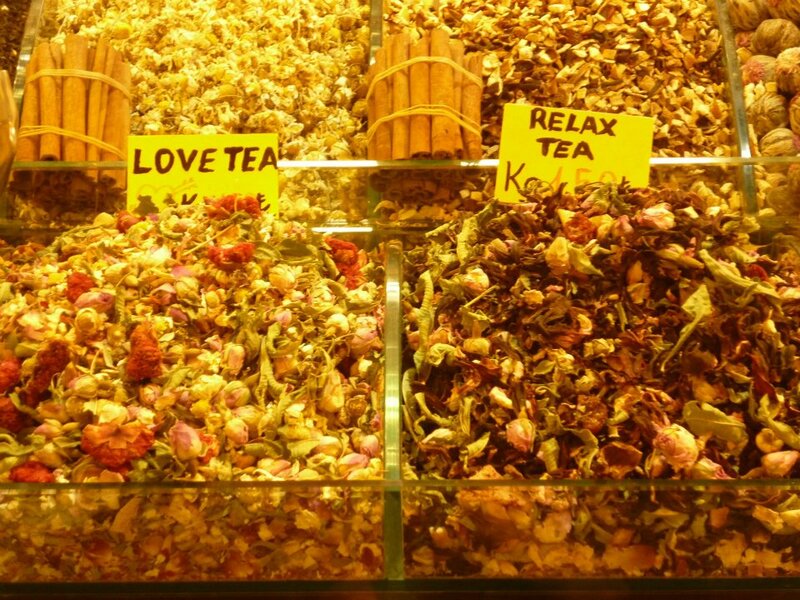 The last exciting thing in the spice bazaar was loose tea and, of course, spices!! 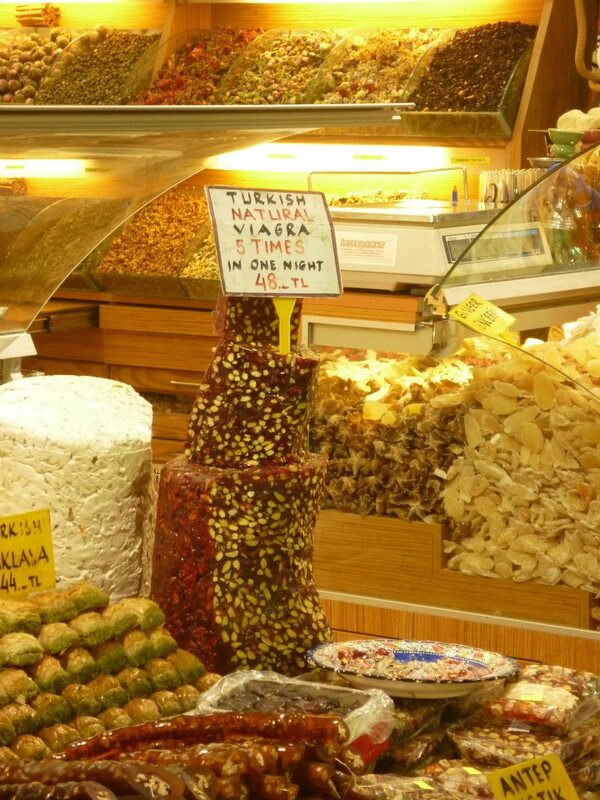 Unfortunately, we were not to discover our all-time favourite Turkish dessert until our final night! And only because we pointed at what the couple at the table next to us had and asked for the same! 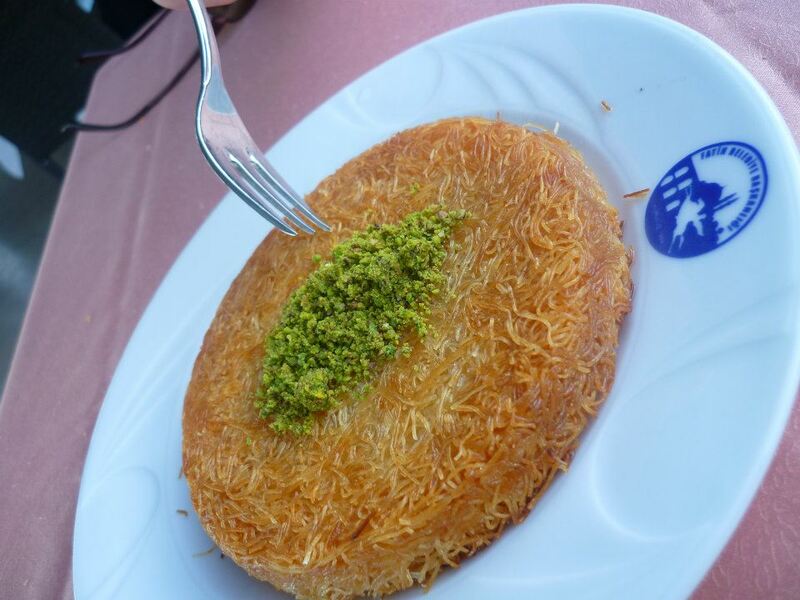 Kunefe, a baked shredded pastry dish stuffed with mild soft white cheese and topped with grated pistachio! The bite of the crispy pastry giving into the soft melty inside of this dish was just to die for! 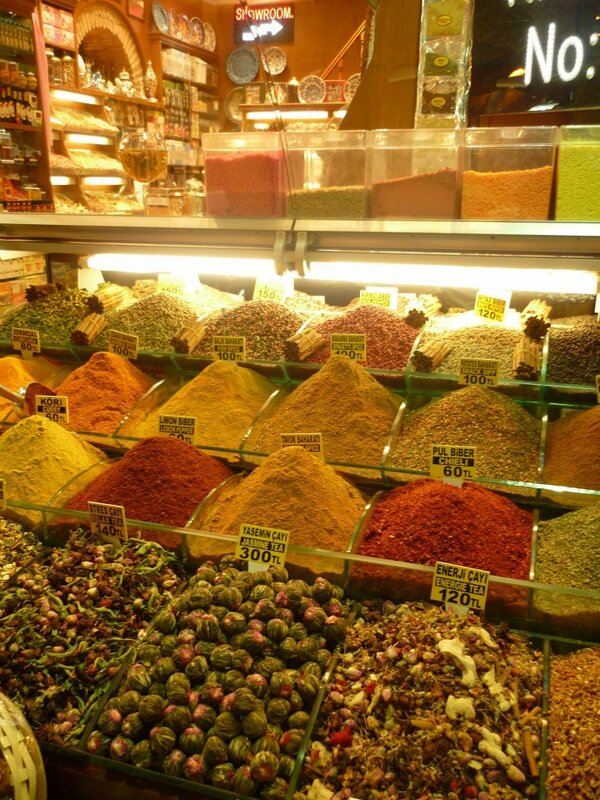 Istanbul really is a fantastic and fascinating city, I highly recommend a visit and not just for the food!